The Mexican midfielder's time at Ibrox is over after Rangers cancelled his deal. 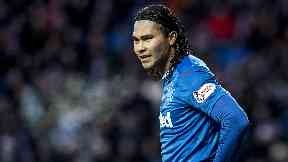 Rangers have terminated the contract of Mexican midfielder Carlos Pena. The 28-year-old still had 16 months left on the deal he had signed with the club but is now a free agent after a turbulent time at Ibrox came to an end. In a brief statement on the club website, a Rangers spokesperson said: "We can confirm that Carlos Pena is no longer a Rangers player. "His contract has been terminated. We wish him the best for his future." Pena arrived at Ibrox in the summer of 2017 as the most high-profile of then-manager Pedro Caixinha's signings. The midfielder scored four goals in 12 games but failed to adapt to life in Glasgow and returned to Mexico on loan. He struggled during loan spells at Necaxa and Cruz Azul. His personal problems were widely reported in his homeland. The Mexican media has reported that Pena is likely to move to Poland to revive his career following the end of his time as a Rangers player.